Rosary Army’s mission statement and contact information for the back of the printable business cards. FLYER COMING SOON – PLEASE CHECK BACK! 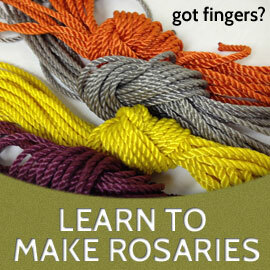 Flyer for the original RA DVD that provides a dynamic talk from RA co-founder Greg Willits, as well as instructions for making several types of all-twine knotted Rosaries (regular, ladder, and two-twine Rosaries).